Caren-Marie Sargent Michel was born in Portland, Maine, and is a lifelong Maine resident. Her work explores the urban, industrial, and pastoral images of Maine and documents the ever-changing landscape in paint. 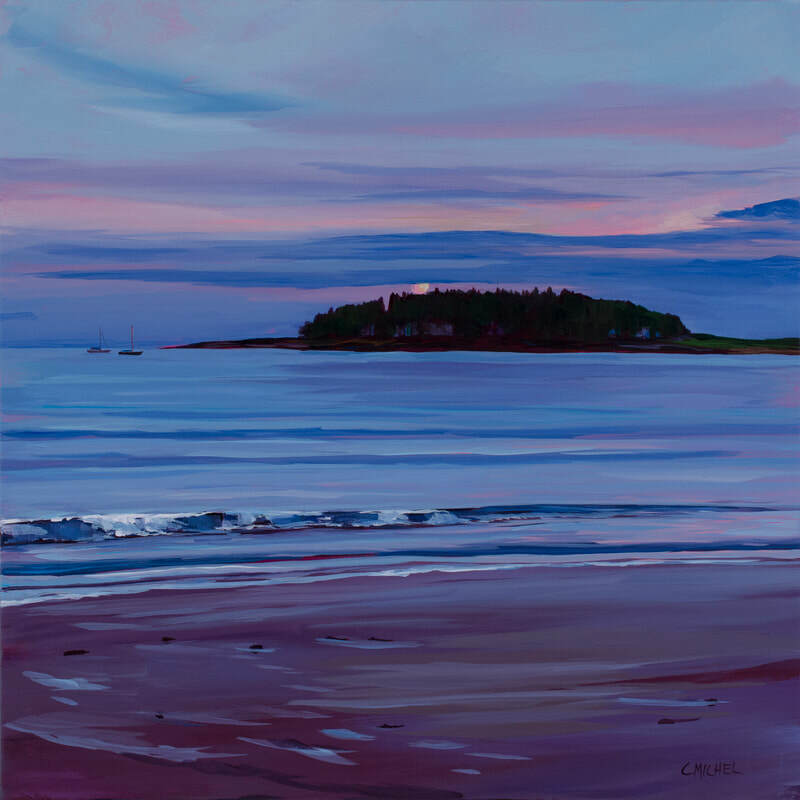 Michel is a devoted plein air painter working in acrylic and pastel on locations all over Maine and New Brunswick, Canada. Michel often portrays a location through series capturing different seasons or times of day with changing light and color. Michel is Past President of the Pastel Painters of Maine and past Treasurer of the Union of Maine Visual Artists. Resume more on "Painted Edges"
I travel around Maine to paint what I see and experience in the landscape: to see color and to paint it. 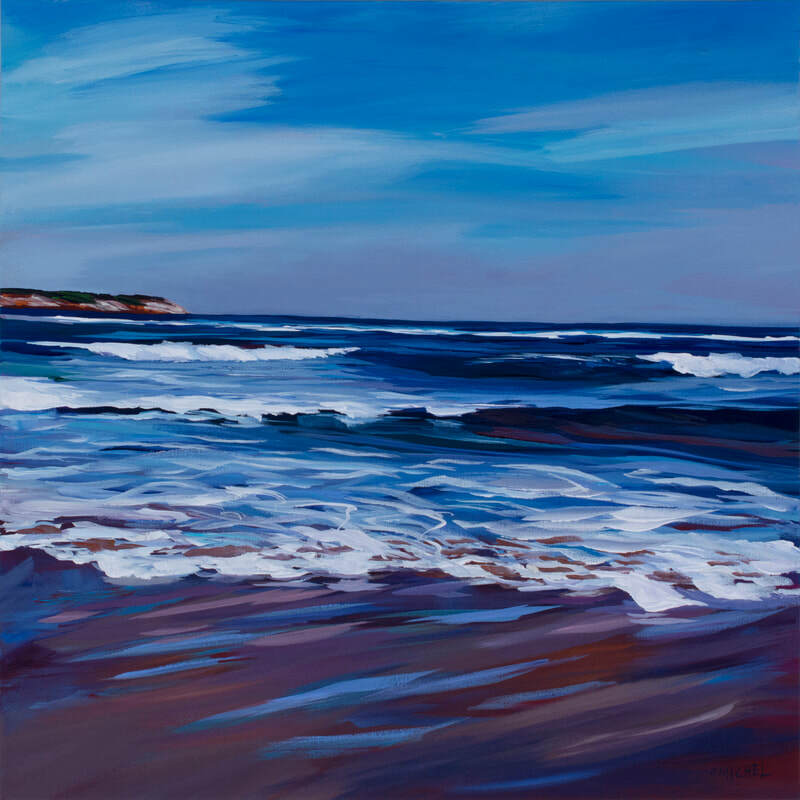 Caren-Marie Michel's Painting Edges 20 was created on the Schoodic Peninsula section of Acadia National Park in Winter Harbor. Unlike other Painting Edges paintings that are taken from the edges of completed works, this piece was created at nine different locations, each a unique painting unto itself. Caren-Marie moved her easel around the area, selecting locations that depict and highlight the beauty of this "quiet side" of Acadia. The pink lines reveal the canvas's under-painting: Caren Marie's signature for all her work.